This article is translated from Swedish to English due to big interest from foreign readers around the world. I did the interview myself with the principal and we got the screendumps with the new “flag-rules” from a student at the school. I also added some information about the “possible” background of the new rules. /Chang Frick, journalist at Nyheter Idag. Click here for the original article in Swedish. The elementary school “Söndrumsskolan” is located in Halmstad, south Sweden. The school has previously attracted media attention when the school management ordered a graffiti painting on one of the school walls by artist Carolina Falkholt. The painting visualize the spreading of naked women’s legs wearing fishnet stockings. This attracted strong criticism from local politician Håkan Wallin (FP). Now a new infected debate flared up at the school when the school administration has issued new rules on how to use the Swedish flag. The rules communicated from the two principals states that the Swedish flag is banned for use with the exception of public ‘flag days’ in the calendar, such as the swedish National Day, and in the event of international exchange with foreign students. Any other use of the Swedish flag is prohibited. When ‘Nyheter Idag’ spoke to principal Hans Åkerlund he explains the idea behind the new rules. The original story, dated 23:rd December, sparked debate on social forums in Sweden. Critics claim that this is typical behaviour of anxious employees working within the public sector, where decicion-making easily go wrong. On twitter, some people claimed this story was related to Islam or muslims, but there is nothing that provides support for that theory. The written rules state that using the Swedish flag in a wrong manner could constitute the crime ‘hate speech’. 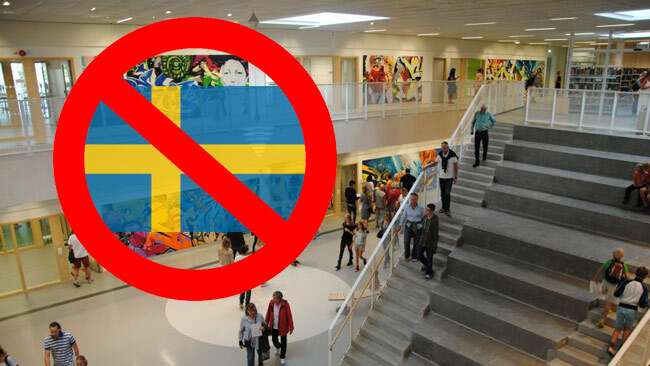 When asked about this, principal Åkerlund explained that ‘students with foreign background could get offended if they see someone wearing a Swedish flag, especially together with a toy gun’.